Lock in a great price for Hotel Biniamar – rated 8.5 by recent guests! Centrally located, lovely pool and good quality food. Breakfast was excellent; good choice and plenty of it. Power Shower was a bonus! Would definitely stay here again. Great location, cleanness, room and bathroom size were perfect. The position is excellent, close to the beautiful beach and in the centre of town which is safe and pedestrianised, The food is excellent we were half board and we enjoyed breakfast and dinner every day. Some staff not so friendly but some are excellent. Especially if you are polite to them. The beds are very comfortable and room was mostly not too bad. Drinks prices in hotel were very fair. And fridge in hotel room was great to have. All in all its a good place with a nice spa pool and excellent food in a great location. 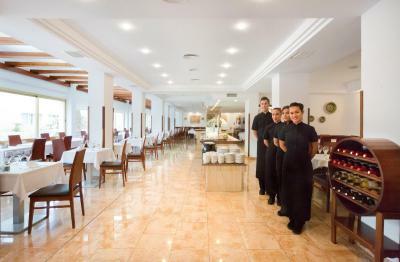 Delicious meals, nice and helpful service, hotel in the center of town, very close to the beach. The room was spotless and the Hotel was so close to every thing you could want. Wir hatten einen sehr schönen Urlaub in diesem Hotel. Die Frauen an der Reception waren sehr freundlich und hilfsbereit. Wir fühlten uns sehr wohl. Die Zimmer wurden tip top gereinigt. Der Strand liegt keine 2 Minuten vom Hotel entfernt. Einkaufsmöglichkeiten gibt es in unmittelbarer Nähe. Das Morgenessen war ebenfalls vielfältig und lecker. 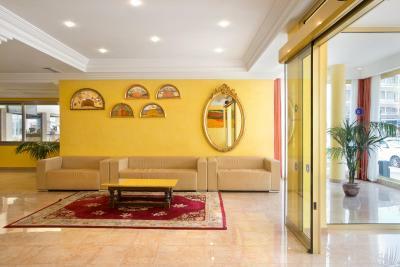 Hotel Biniamar This rating is a reflection of how the property compares to the industry standard when it comes to price, facilities and services available. It's based on a self-evaluation by the property. Use this rating to help choose your stay! This hotel is located in the center of Cala Millor, only 150 feet from the beach and the pedestrian promenade, with all shopping facilities nearby. The rooms boast plenty of natural light and enjoy views of the sea and swimming pool. 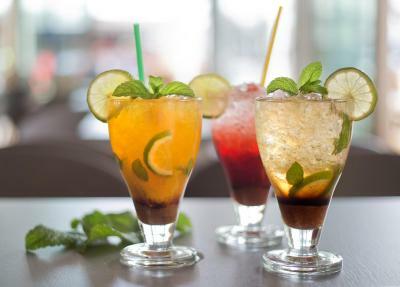 There is also an excellent cafe with terrace situated in the pedestrian area with musical entertainment at night. 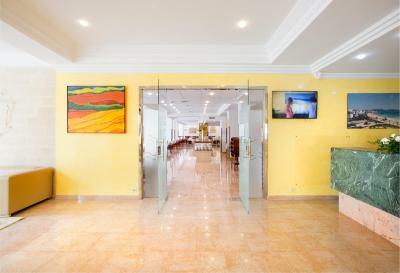 Relax here in the comfortable facilities of this hotel and enjoy a very pleasant stay next to the sea. Seasonal hotel: open from May to October. 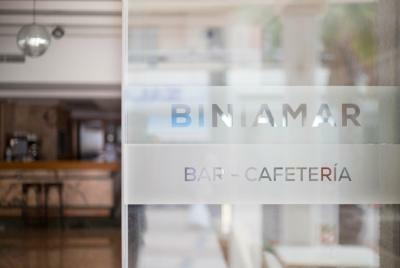 When would you like to stay at Hotel Biniamar? This air-conditioned room includes satellite TV, a balcony and a private bathroom with a hairdryer. House Rules Hotel Biniamar takes special requests – add in the next step! Hotel Biniamar accepts these cards and reserves the right to temporarily hold an amount prior to arrival. Breakfast- sweets as cakes, cookies were not fresh at all, the rest was quite ok. The WiFi is appalling with a silly setup in the room and almost no signal around hotel I had to use the hotel across roads WiFi! Shower is nice but the leak into bathroom from it is annoying. Some fittings were unsafe and unrectified after reporting three times. Shower gel and shampoo given on first day only,great for a one day stay but when you pay a lot for 14 days you should get each day. Poor English from most staff,however I believe you should try to talk the local language. Dogs are allowed in hotel, I love dogs but not when they are left to bark for hours and allowed to swim in the pool! I do not think I should have to pay extra for a safe in this day and after the high cost of room! Swimming pool rules.are too lax,our first days were ruined by boys violently throwing balls, not controlled or stopped, was lovely after they left. You sit next to your neighbour on balcony, with no "wall" in between. They looked in to us and our room. All staff do not speak even basic English, Only spanish and german. After taking the shower the water goes outside the bathroom because there is only sliding doors made of glass which do not stick well to the floor. Internet was poor with signal dropping out every couple of minutes.